Topics: I-learn Center, Hospital, and Cti Sheets. 140 users visit the site each day, each viewing 2.40 pages. It is hosted by Cerfnet California, using Microsoft-IIS/7 web server. The programming language environment is ASP.NET. 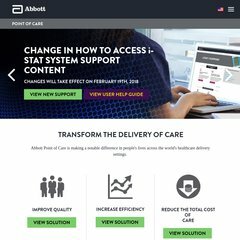 It has 4 nameservers, including rossns.abbott.com, rossns2.abbott.com, and abtnsdmz1.abbott.com.